Summary: Eric’s little sister Alice is a monumental pest. He finally gets so angry with her and with the unfair punishment meted out by his parents that he loses his gravity and floats up to the ceiling, out the window, and right up into the sky. Eric’s gravity returns with his happiness, and he lands in a tree, from which he is rescued by his relieved parents. Just as Alice is about to lose her gravity over a missing toy, Eric comes to her rescue. Literary elements at work in the story: This is a plot-driven story about the chaos which occurs when a community breaks down. It is also a cautionary tale for both parents and children about losing one’s temper. Somewhat ironically, chaos adversely affects the story itself, and it fails to maintain its own interior logic in a couple of places. The major plot thread concerns the fact that losing one’s temper results in losing one’s gravity. However, this inventive law of physics apparently only works with children. Eric’s parents are just as out of control as he is, running around with their mouths stretched into preschool parodies of tantrums, clutching their heads, blaming one another for all that has gone wrong, and yet neither of them floats up to the ceiling. Also problematic is the fact that having an emotional melt-down results in a weightlessness that causes great joy. However, happiness then returns the effects of gravity, which leads to loneliness and sadness as Eric falls into a tree outside his apartment building. It is hard to know what to aim for here. How does the perspective on gender/race/culture/economics/ability make a difference to the story? This story is about a nuclear family in an urban setting. The father is Caucasian (and in one illustration challenges the stereotype that anyone irons these days); the mother may be either Caucasian or African American; and there are two children, a boy and a girl. Theological Conversation Partners: Despite problems with its plot, this book might be a good jumping off point for conversations about handling anger. The Epistles are filled with admonitions to the early Christian communities to understand how important it is to forbear the foibles of others. Paul begged the Ephesians to live with “with all humility and gentleness, with patience, bearing with one another in love, making every effort to maintain the unity of the Spirit in the bond of peace.” (Eph. 4:2-3) In 1 Peter 4:8-9, the community hears, “Above all, maintain constant love for one another, for love covers a multitude of sins. Be hospitable to one another without complaining.” Obviously, anger and injustice were a part of those early communities, just as they are in Eric’s house. Perhaps questions of what anchors us to one another would be in order here. When we forget that God is at our center, our world is turned upside down. When was the last time you got angry at someone in your family? What were you angry about? Tell how your body feels when you get angry. Look at Eric’s mouth in the pages of this book. What do you think he is feeling on each page? Even though we all get angry sometimes, how do you think that God wants our families to work together? 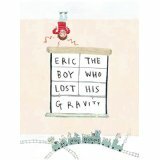 Eric the Boy Who Lost His Gravity by Storypath is licensed under a Creative Commons Attribution-NonCommercial 4.0 International License.